On the 24th of January 2019, our dear colleague and Premio Berlino 2018 winner Valentina Travaglino shared her story of working with TSPA for the last 4 months. 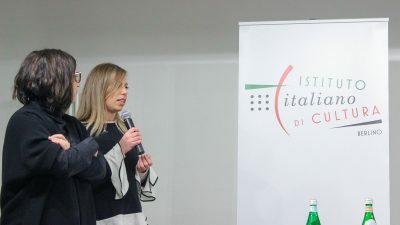 Presented at the Italian Institute of Culture (Istituto Italiano di Cultura Berlino), she shared her experiences and presented a status update of her work within TSPA. Premio Berlino has been awarded for the second time to young architects for the excellence in their work. The program allows two Italian architects, who excel in the reuse and urban regeneration of urban spaces, to spend 6 months working within an architecture or urban planning office in Berlin. This program is funded by the Italian Ministries of Culture and Foreign Affairs. TSPA feels honored that Valentina chose our office to spend 6 months working and collaborating on certain projects, such as the Impulse.Berlin project and the currently developing project of the three cities (Alto Molúcuè, Gurué and Milange) in Mozambique. During her presentation she shared her time approach and findings on what kind of challenges Mozambique faces and will face in the future and the research she has carried out. The presentations at the Italian Institute were free to the public and we were happy to see that the evening was well attended. Want to follow Valentina Travaglino and her work at TSPA? Premio Berlino has set a final presentation of the six month period in March 2019, which is also accessible to the public. The final presentation of Valentina’s time at TSPA will be held at the Aedes Metropolitan Laboratory, so keep an eye on this website for when the actual date has been set! Updates will also be shared via our TSPA Twitter, Instagram and Facebook!